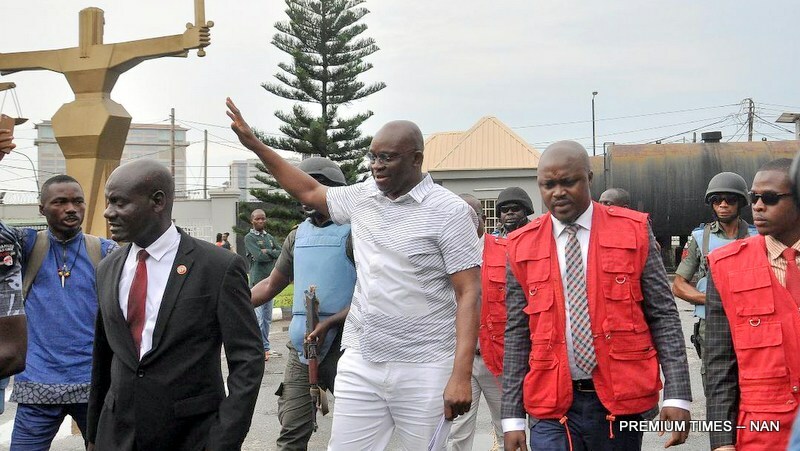 The criminal trial of the former Ekiti State governor, Ayo Fayose, before a Lagos Division of the Federal High Court continued Monday with Musiliu Obanikoro continuing his evidence against the defendant. Mr Obanikoro, a former minister of state for defence, at the last court sitting narrated how he was asked to pay millions of dollars of public funds to Mr Fayose. The Economic and Financial Crimes Commission is accusing Mr Fayose and his company, Spotless Limited, of receiving millions of dollars from the office of the former National Security Adviser, Dasuki Sambo. The monies are believed to have been meant for the prosecution of the war against Boko Haram. Continuing his evidence on Monday, the former minister said his past relationship with Mr Fayose made him a reluctant witness against the former governor. “Yes, it is painful for me to give evidence against him,” Mr Obanikoro, who is now a member of the All Progressives Congress, said during cross-examination. Mr Obanikoro said he was in Ado Ekiti during the 2014 governorship election in Ekiti State to do the bidding of the Peoples Democratic Party, as a leader of the party. The cross-examination which lasted for about four hours saw Mr Obanikoro clarifying some of the roles he played during the Ekiti 2014 election including as it relates to disbursement of funds from the federal government. He denied that his properties had been seized by the EFCC during the early days of his interrogation before he agreed to appear as the prosecution witness, describing the story as a means for the media to “sell their papers.”. “At no point was any of my property confiscated during the investigation to the best of my knowledge,” Mr Obanikoro said. He, however, admitted that he forfeited some funds to the EFCC. On his activities for Sylvan Mcmanara, a company he was said to have paid monies to for contracts that were never executed by the NSA in 2016, Mr Obanikoro said he does not have any relationship with the company other than the “supervisory role” he played. He also told the court that prior to the NSA paying the sum of N200 million to the company’s account, the account balance of Sylvan Mcmanara as at May 31, 2014, was N74,299. The company’s statement of account read before the court showed that prior to 2014 when monies were paid by NSA into the account, Gbolahan Obanikoro, Mr Obanikoro’s son, had made a payment of N20,000 and N5 million on the May 18th, 2012, and in September 2012 respectively to the account. Mr Obanikoro, himself, also made deposits to the account. When asked questions about the purpose of the funds sent out of the Sylvan Mcmanara account after N200 million naira was paid into it on the 5th of June 2014 and who authorised the payouts; Mr Obanikoro said he was sure it was done for the benefit of Mr Fayose. While reading from a statement he made to the EFCC in 2016, Mr Obanikoro said he converted some of the funds to dollars at the instance of Mr Fayose. On why he agreed to refund N200 million to the EFCC, Mr Obanikoro said it was a “reluctant agreement because I even said in the statement (to the EFCC) that I deserve a medal for successfully protecting Lagos. Mojisola Olatoregun, the judge, adjourned the trial till February 5 for the continuation of cross-examination.